LiSTEN to Kristin Brogdon talk about "Seahawk Fam" performances and Karola Luttringhaus describe her piece, "The Light of the Water"
UNCW’s Office of the Arts presents a summertime series of performances for all ages again this year: Seahawk FAM. A variety of performers take the stage Thursday mornings through the end of July. Director of UNCW’s Office of the Arts, Kristin Brogdon, developed this program with Operations Manager Jeremy Summers last year; it’s already grown from 5 to 6 performances. When I visited Kenan, Karola Luttringhaus was working on her piece. 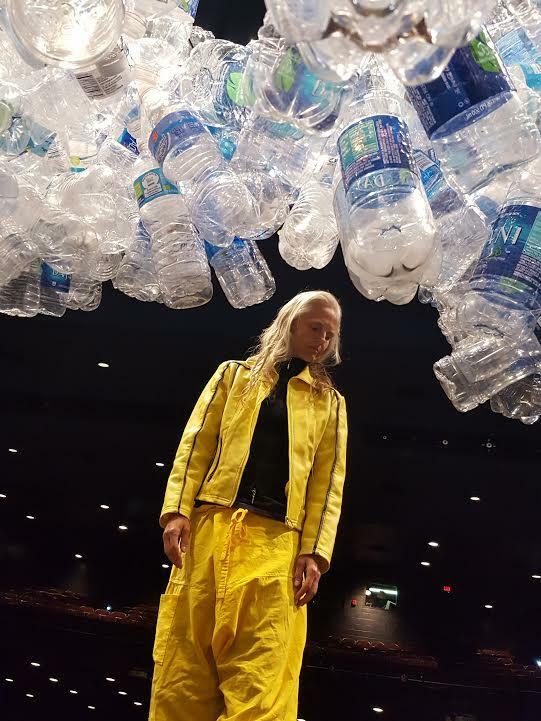 The stage was covered with over 4000 plastic bottles-and more are on the way. Listen to Karola and Kristin above and see the schedule below. Madafo the Griot Madafo performs in the tradition of the Griot, the African Storyteller, Musician, Historian, the one responsible for keeping the principles and values and the History of the people alive and vibrant. The Secret Garden with the Brierwood Ensemble Pairing narrated excerpts from Frances Hodgson Burnett’s classic novel with musical illustrations and interludes, the Brierwood Ensemble tells the story of Mary Lennox’s journey from India to England and her family’s renewal through the cultivation of nature. The Light of the Water/Alban Elved Dance The 'Light of the Water' by choreographer Karola Luttringhaus and musician Perry Smith is an interdisciplinary performance in dance, film, sculpture, costuming and creative music. Intriguing imagery, and original physicality merge with multi cultural sounds played live on a variety of electronic, acoustic and home made water instruments. The piece examines the many aspects of water, its characteristics and meaning for our lives. Tickets for all shows are $5 and are available online, at the door, or by calling 910-962-3500. Karola Luttringhaus: Well in front of you here you see a sculpture that is part of our set design. It's a canopy made up of what's going to be 6000 ish plastic bottles. And yeah they're forming this canopy that rises all the way up and does things and comes on and we change its formation and it turns into carpet and into a tapestry... So it's kind of the centerpiece of the work that we're putting together called "The Light of the Water." And it's a performance for all ages about water, about our relationship to water, about us looking at water, feeling water, listening to water, putting our bodies into water, thinking about the body of water- what's it made of, you know chemically speaking. 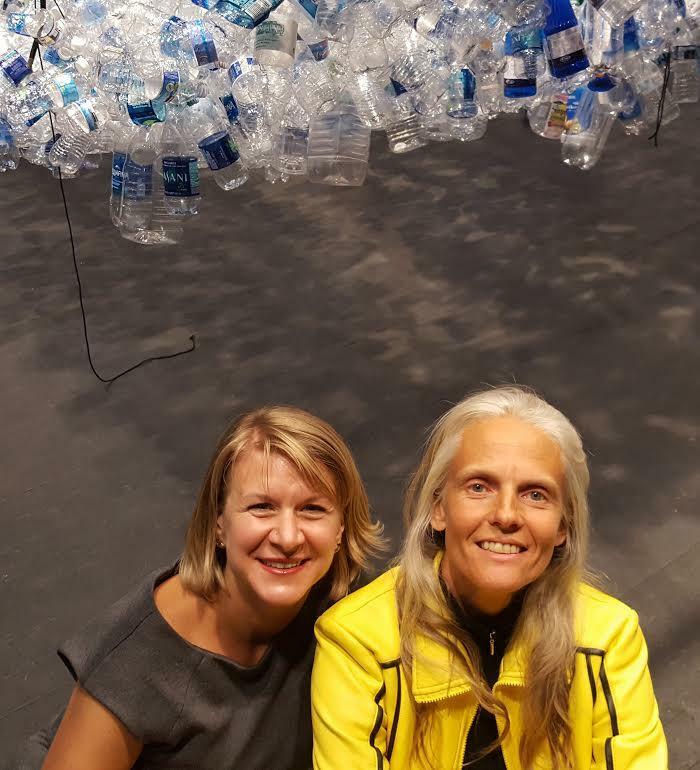 And then some of the sort of current issues around water started out-as you might take from this sculpture-to talk about plastic pollution of the ocean and all other waterways and then ties into the current Gen-X drinking water crisis. So that's a piece that has many parallel layers of topics. You know, as an artist, I'm trying to bring a new look and you know encouraging people to look again at water and see if there isn't something new we can discover, perhaps hopefully, then encourage all of us to be more careful to be more protective of our water and the quality of our water. And to understand all the connections that that ties into..... We're [musically] playing as much water as possible. So not instruments and keyboards and whatever are guitars but we're we're exploring with water so we have an experimental kitchen scene, or you know we look at various things like teakettles, and ice, and glasses of water. And so what can we get out of water- what can water do- what all is water- and try to get as broad, as big, and as detailed a look about waters as we can in this framework.